Hemingway’s stories of sportfishing in the Caribbean have enthralled me since I was teenager. Port Antonio, Jamaica is one of my favorite places on the planet. So when a call came out of the blue asking me to be part of Gordon “Butch” Stewart’s team for the 47th Port Antonio International Marlin Tournament, I jumped at the chance. Butch is famous as the chairman of Sandals Resorts International and we’ve shared a few laughs in my 15 years covering Caribbean tourism. As good-humored as these exchanges have been, it would be a lie to say we’ve shared any personal moments. I thought the marlin tournament would be a unique opportunity to catch a glimpse of the real man. The fact that the rest of the team would be composed of Butch’s childhood friends and some heavy-hitters from London made it even more intriguing. My fiancée Sophy and I arrived in Port Antonio on a drizzly Saturday afternoon. The sportfishing team would be staying at the property that was formerly named Dragon Bay Resort. Butch had bought it nine years ago and since the purchase the resort had lain fallow. A number of factors were holding up the resort’s renovation and reopening; chief among them were the inadequacies of Port Antonio’s airport, which is incapable of receiving international flights. Dragon Bay may have been hip and happening back in the 80s, when it served as the backdrop for Hollywood hits Cocktail and Club Paradise. Nine lost years had transformed Dragon Bay into the perfect setting for a Caribbean version of The Shining – there was even a rusting dragon sculpture in the courtyard, waiting to creak into life under the light of the moon. Although the passing years had done its damage to walls, roofs and walkways, it was obvious that Dragon Bay had “good bones” and could be renovated to be on par with Sandals Royal Plantation in Ocho Rios. Sophy and I plunged into the experience of staying at an abandoned property and roamed the resort, marveling at the European ambience and beautiful private bay and beach. At breakfast early the next morning, I had a chance to chat with Butch about his plans for Dragon Bay. “We’ll extend the rooms radically – we’re good at that,” said Butch. “The current room count is 66 rooms and 33 one-bedroom suites; we’ll add 120 keys, half of these will be extensive suites and large rooms.” Butch mentioned that he’d recently spent ten days at Canyon Ranch in Tucson and he was impressed by the property’s wellness program. On re-opening, Dragon Bay will be something of a Jamaica-style Canyon Ranch, which fits in perfectly with the low-key, nature-based tourism in Port Antonio. After breakfast we piled into vehicles and took off for the marina, where we boarded Butch’s 90-foot fishing craft, the Sir Jon II. It was a beautifully appointed boat, impeccably clean; a homespun touch inside the cabin was framed photos of Butch’s kids. 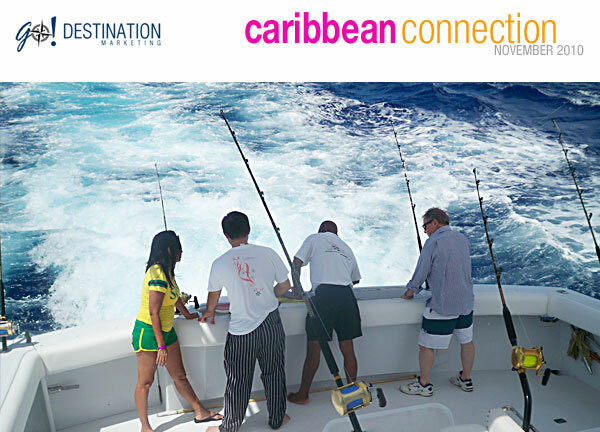 At a signal, the boats participating in the tournament sped out of the harbor towards the prime marlin fishing grounds, accompanied by the Jamaican Coast Guard. It was an exciting, full-throttle start to the contest. Over the next couple of days, there’d be moments of languor punctuated by excitement. The highlight was the hooking and landing of a 285-pound Atlantic Blue Marlin, which put up a 45-minute fight before Butch finally reeled it in to the side of the boat, where it was measured, photographed and tagged before being released. The tournament observes catch-and-release, although if you land a fish over 300 pounds you can bring it in. Above, video of Butch bringing in a 285-pound Atlantic Blue Marlin. Since its catch-and-release, there’s only a tantalizing glimpse of the marlin. Although the 285-pounder proved to be sole marlin we hooked the two days I was on board, we were lucky enough to land a glittering, ten-pound golden mahi-mahi. The fish made an excellent lunch accompanied by grilled plantains and pumpkin soup, served up by the boat’s executive chef, Sukru Condon, who was on loan from the Sandals Royal Bahamian. Above, video of landing our lunch – a mahi-mahi. During one of the quiet moments, Butch and I headed up to the pilothouse to talk about the travel industry. I filmed his comments as he outlined his plans for marketing Sandals as Luxury Included Vacations (having more luxury inclusions than any other all-inclusive resort company), and described an ongoing mega-fam of 4,500 agents; new over-the water suites at Sandals Grande St. Lucian, changes to the Royal Plantation brand and outreach initiatives from the Sandals Foundation. Over the course of the fishing tournament, it was interesting to see Butch in action. By 7:00 am he was already on his 10th international business call, working the phone, sculpting deals, and handing out blistering assessments of those who fell short in his eyes. As he talked, he’d turn the pages of the daily paper. It was only later that I put two-and-two together and realized he was checking out the morning edition of the Jamaica Observer, the paper he owns. It was obvious to me I was seeing a living example of a man at the top of his game, and that you don’t stay at the top tooling down the highway on cruise control. This was evident in the drive Butch displayed as a fisherman. It even showed when he played dominoes with his childhood friends. There was a lot of easy banter and camaraderie as the dominos slapped the table; there was also the unspoken philosophy that if you’re in the game, winning is good. Above video of Butch playing dominoes with childhood friends at his Blue Lagoon villa.